While some may initially discount this book as not being serious or valuable to a Benedictine reader because of the catchy title, please don’t fall into this judgment. In this readable book, you will find gracious wisdom in the accounts of the author’s experiences of finding God in the present moment and in the ordinariness off daily life, two important Benedictine practices. Denise Roy offers thirty-five entertaining yet touching stories that show how family moments can bring great spiritual rewards. Her honesty about the challenges of daily life and her discoveries of how to find the sacred in them offer examples for all of us, regardless of gender or family situation. Here Denise reflects on the endless task of cleaning up after her children. Some of us may not have or have had children, but I know that all of us can relate to the relentlessness of dealing with our own clutter or with life’s endlessly repeating situations, whatever these might be. Roy encourages us to “experience something that is already there—a Presence in our midst, patiently waiting for us to open our hearts.” Denise describes moments when the grace of God bursts upon her as she becomes open and present to the moment and swept up in the joy of life. Her stories are wonderful, easy to read and provide meaningful paths into the practices of Benedictine living as she invites us into both reflection and spiritual practice. So don’t be fooled by the lightness of the title of this delightful and helpful book. Read it and learn ways to follow Denise in her stunning embrace of the holiness that is around her. 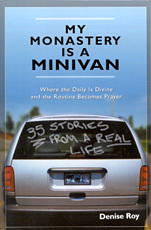 My Monastery is a Minivan: Where the Daily is Divine and the Routine Becomes Prayer. By Denise Roy. Chicago: Loyola Press, 2001. To order from Amazon.com, click here. Denise Roy is a mother of four, a psychotherapist, a spiritual directory, and the founder of FamilySpirit, an organization that nurtures spirituality in families. She received her master of divinity from the Jesuit School of Theology in Berkeley, California. She and her family live in the San Francisco Bay Area, where she spends a good deal of time in her minivan. Denise has published other books, too. Please visit her website to learn more at www.familyspirit.com/. Copyright © 2005/2012 St. Benedict's Toolbox – Jane A. Tomaine - All rights reserved. Reproduction of any materials on this web site for any purpose other than personal use without written consent is prohibited.